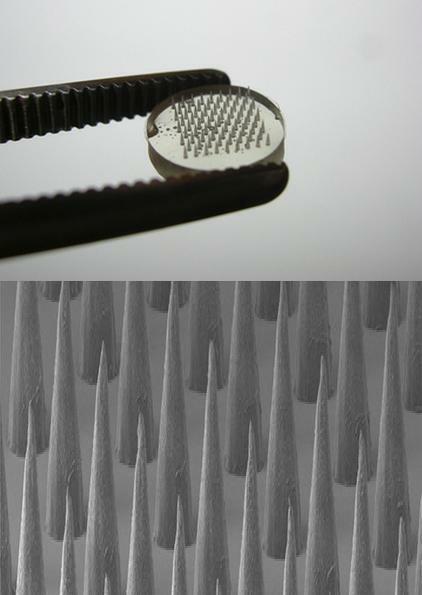 A vaccine patch and a view of the “needles” using scanning electron microscopy. This might be a new way to get a shot. Funded in part by the NIH, this vaccine patch  is coated in a thin film that literally melts into the skin when the patch is applied. The film contains DNA, rather than protein, which is absorbed by the skin cells and triggers an immune reaction. It seems to be effective in animal models. DNA vaccines are attractive because they may not require refrigeration like typical protein vaccines and can be stably stored for weeks. And, though this patch looks spiky, the length of the needles can be adjusted so that they don’t reach the skin layers that contain nerves. Thus: no ouch.